While CodePlex has been the home to a wide variety of projects, its focus lay on projects using Microsoft software such as the .NET Framework or ASP.NET. When you visit CodePlex right now, you see the shut down notification at the top of the site. It links to this blog post. Reasons for shutting down CodePlex include a decrease in usage — less than 350 projects hat a code commit in the past 30 days — a spam epidemic in 2015, and the migration of a lot of projects to GitHub. In fact, most of Microsoft’s own projects moved to GitHub as well. Microsoft plans to shut down Codeplex on December 15th, 2017. The company will set all projects to read-only starting October 2017, and has disabled the option to create new CodePlex projects already. A full backup of the site will be created before the shut down. 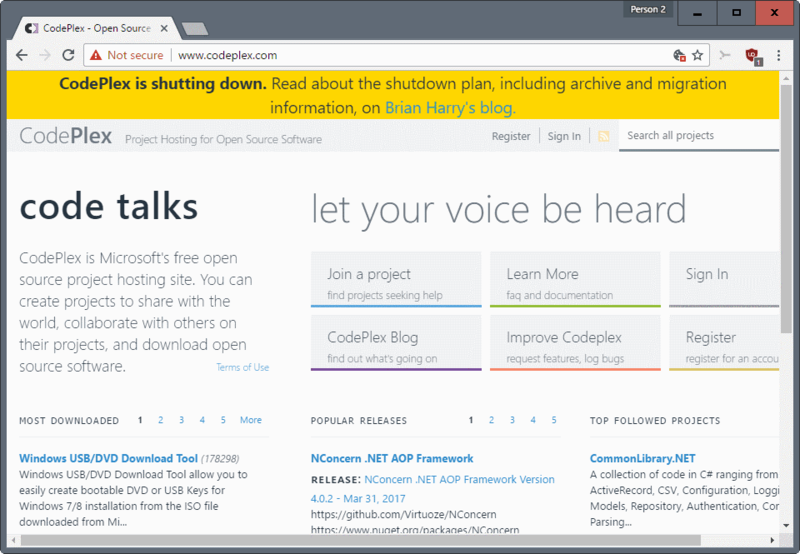 Shut down means that Microsoft will decommission the existing CodePlex site and servers, and replace it with a read-only, archived copy of the site. This means that access to source codes, downloads, documentation and more is still provided after the shut down of the site’s core. You’ll also be able to download an archive file with your project contents, all in common, transferrable formats like Markdown and JSON. Where possible, we’ll put in place redirects so that existing URLs work, or at least redirect you to the project’s new homepage on the archive. Microsoft notes that it does not have plans currently to shut down the archive version of Codeplex. As far as migration is concerned, the company suggests that projects migrate their data to GitHub instead. How that is done is highlighted on this wiki page on Codeplex. Basically, what project administrators need to do is sign in to their Codeplex account and to their GitHub account, open the project they want to migrate on Codeplex, select the GitHub button on Codeplex, create a new repository on GitHub, and use the import button on the site to import the Codeplex project to GitHub. Administrators may also download an archive file of the project. Options to migrate just the source code are provided as well. Site note: A quick check here on Ghacks shows 123 articles that reference CodePlex in one form or the other. Most of those pages link to programs that are hosted on CodePlex. The post Microsoft shuts down CodePlex on December 15th, 2017 appeared first on gHacks Technology News. This entry was posted on Tuesday, April 11th, 2017 at 11:05 am	and is filed under General News. You can follow any responses to this entry through the RSS 2.0 feed. Both comments and pings are currently closed.